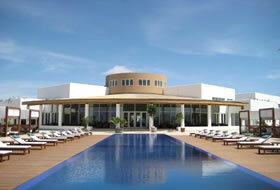 Hotel Paracas, a Luxury Collection Resort is the perfect place to rest in the Peruvian coast. From Lima travel 3 hours by car or 45 minutes by plane. The hotel is located near the nature reserve where you can admire the marine life (sea lions, flamingos, dolphins, penguins), and where more than two thousand years after his birth Paracas.Estratégicamente culture located in the bay, opposite the Natural Reserve Paracas, Paracas site will become the luxury spa resort most important of the Peruvian coast and will be the ideal starting point for excursions to the Ballestas Islands from the private dock. In addition, a number of activities may be conducted from the Paracas hotel as private aircraft overflights of the Nazca lines, tours of the islands by yacht and sightseeing in the area. Hotel Paracas is one of the major five star hotels in southern Spain and will have an area of 34 136 m2, 120 rooms, two restaurants, a bar-lounge, a luxury spa, conference rooms for up to 500 people and a variety of activities available to our huéspedes. Déjese surprised by the warmth and authenticity of the Paracas luxury accommodation in a world where you will be the protagonist. All you have to do is enjoy your stay. Guests can enjoy the 120 rooms, two swimming pools or relax in the spa of 547 m2. They can enjoy the combination of Peruvian and Mediterranean flavors in the main restaurant, a trattoria or a bar lounge. In addition, the conference room is ideal for weddings, events and conferences as it has capacity for 460 people and has audiovisual equipment top quality. 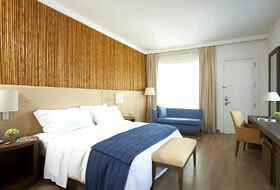 Superior room (sea view or garden view): 36m2 Room decorated mainly with bamboo and wooden furniture. This type of room has a king bed or two twin XL full, an alarm clock with iPod charger, an LCD TV 37 "and a fully equipped bathroom. Suite: This room is always on the first floor and has a decoration full of bamboo, wood and textiles. The master bedroom has a king size bed, an alarm clock with iPod charger and a LCD TV 37 "while the room has a LCD TV 42" and a sofa bed that can be used for two children under 10 years. Solarium Suite: Located on the second floor as long as it has two terraces, one with a table and six chairs. 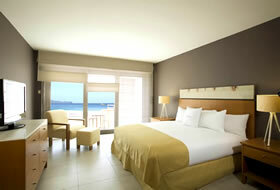 The room has a large sofa bed ideal to sleep two children under 10 years and the master bedroom with a king size bed. Both rooms have LCD TVs. Presidential Suite: Suite with two terraces, one with a table and six chairs and the other with a small swimming pool, perfect for cooling during the day. The room is separated from the living room includes a king bed with 400 thread count sheets and a comfortable sofa. 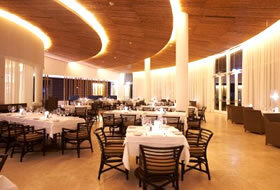 * Restaurant Ballestas: A dining experience that enhances the flavors of Peruvian and Mediterranean cuisine. Guests can enjoy lunch and dinner a la carte menu for children, buffet breakfast with a spectacular view of the Bay of Paracas. * La Trattoria: An ideal place for families to enjoy hand-made pizza, pasta and delicious ice cream in a friendly atmosphere. * Bar Zarcillo: Keep an adventurous day in our bar cooling with one of our types of cocktails, an experience full of pisco. 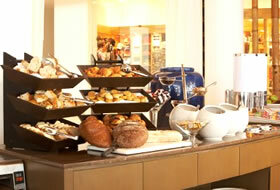 * Bar Lounge: At the end of the day guests can relax in our lounge while enjoying some snacks and your favorite beverage. * Pools: Water is central to the decoration of the Hotel and that is why it has two heated pools throughout the year. The main pool, in front of the lounge bar and family, near the playground area. * Business Center: For corporate travelers, we have three computers and one printer 24 hours. 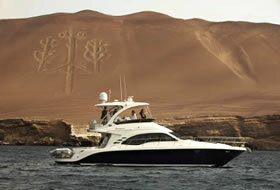 Climate all year round there is warm weather, no rain, Paracas is known for being a desert area. Do not forget: Sunscreen, sunglasses, binoculars, camera and camcorder. Foreign exchange: The official currency is the Nuevo Sol, represented by the symbol "S /.." Most establishments accept dollars at the daily exchange rate. Getting There: The Pan American Highway from Lima to Pisco (Paracas 250 km-4 hrs). Also offer flights on plane from Lima to Nazca and Ica, Paracas. There is no public transport in the Paracas National Reserve. Nazca lines, Nazca Lines: There are many theories that have sprung up around these mysterious prints: from the runways suggesting for extraterrestrials to the lines you see on a giant seismograph. Most likely, as noted by Maria Reiche, a German who devoted his life to studying the lines, it is a monumental astronomical calendar whose figures marked different solar periods or phases. Paracas National Reserve: Visit one of the 335 thousand hectares of this reserve through an arid desert that houses a variety of sea birds and wildlife that can be seen in its natural environment. Ballestas Islands: The islands are spectacular and are home to thousands of birds and sea lions. The islands have over 150 species of seabirds including penguins, pelicans and sometimes even dolphins swimming in the sea.